Here is another snowflake. 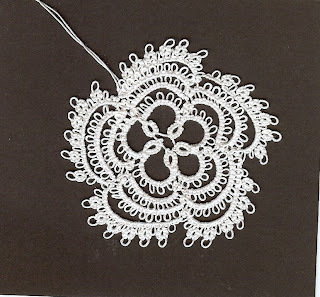 This one is from DMC Festive Tatting. I adjusted the pattern when I make this. You were insstructed to cut and tie the thread after every round. Instead I left a long tail and used a split ring to clumb out to the next round. I think it worked out very well and I was happy to not have to finish off all those ends. However, I think I needed to sung up the center rings so it doesn't look so gappy. Now it is going to the window for Christmas. Our snow came down overnight about 3 1/2 inches. I am glad I did not have to go anywhere today and can just enjoy the scenery outside my window. Thanks Tatting Chic for taking the time to view and comment on my attempts. It means a lot to get some feedback.